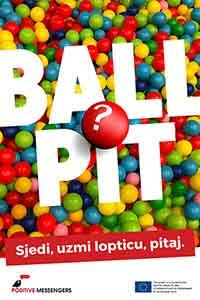 We intend to make a popular ball pit (like those found in amusement parks) but in much smaller size - only two persons would be able to sit in it. That pool would be located in a busy pedestrian area with many passers-by. One immigrant would sit on a chair in a pit. The other chair would be empty and it would serve as an invitation to passers-by to interact: HAVE A SEAT - TAKE A BALL - ASK A QUESTION. When a passer-by sits in front of the immigrant and takes a ball, he/she will see on it a series of questions for the immigrant. After answering, the immigrant may ask his/her own questions. That way they will ask each other questions and the immigrant will get to know this random unknown passer-by.